Notes: The movie would probably be more appropriately titled "The Cats Return." Both the Baron and Muta appear in another Studio Ghibli title, Whisper of the Heart. 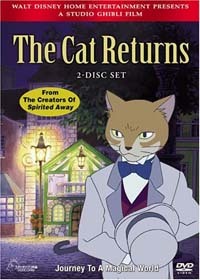 The film is only referenced once though, and you can enjoy The Cat Returns without having seen Whisper. The film is based on the novel Neko no Danshaku, Baron (literally "Baron, the Cat Baron") by Hiiragi Aoi. One day after school, Haru, your average high-schooler, heroically saves a cat from being run over. It turns out she didn't save just any cat...but the prince of the cat kingdom! In order to show their respect, the kingdom of cats bestows many gifts upon Haru and eventually asks her to come to their lands and marry the prince. Marrying a feline wasn't exactly on Haru's to-do list, so, following some anonymous advice, she seeks out the help of the "Cat's Business Office". Just when Haru thinks everything is going to turn out fine after all, the royal entourage shows up and sweeps her off to their empire. It's now up to the rag-tag members of the so-called Cat Business Office to rescue Haru before she ends up eating mice for the rest of her life. I think it goes without saying that when it comes to Studio Ghibli titles (Spirited Away, Grave of the Fireflies, My Neighbor Totoro) that a certain level of quality is expected. If a feature is anything LESS than breath-taking it's considered a disappointment. And while I can't say that The Cat Returns is my favorite of their releases, I certainly don't think anyone will be sticking a negative label on the piece anytime soon. The animation is absolutely flawless. In many scenes we're treated to incredibly detailed scenes of Tokyo, you can even recognize individual streets. But on the flip side we have the magical cat kingdom where everything is wonderfully surreal. While there are a handful of scenes where CGI is apparent, you won't see a lot of fancy effects here. The overall affect is much more reminiscent of traditional cel animation. The musical accompaniment is light, whimsical, and suits just right without ever being over-bearing. The best way to view this movie (and after watching through it three or four times over, I've had chance to experiment) is simply to sit back and enjoy all the finer details. From kitty-cat secret-service agents to the "Puma" golf bag the king carries, there's plenty to amuse and amaze. Overall, this isn't a bad way to spend an hour or so. So, what stops this title from getting full marks? There's quite a few flaws in the overall make-up that detract from the overall effect of the film. First and foremost is the remarkably large gap in characterization. Several of the main cast of The Cat Returns are extremely well-developed and interesting. Unfortunately, the main character is not one such person. Haru is as wishy-washy as they come, and the theme of her personal growth throughout the film just doesn't stick at all. The lines regarding this seemed forced or added on as a mere afterthought. The main villain as well is your stereotypical selfish baddie who won't be the favorite of anyone in the audience. On the other side of the coin the Baron and Muta are colorful, wonderful, and an overall delight to behold with extremely distinct personalities. Those two steal the show by far and the movie probably would have been much more interesting if it had solely been based on them. Secondly, and possibly mostly due to reasons stated above, the movie lacks an overall theme. They attempt to install one but the impact is greatly lessened by Haru's total lack of initiative and just how unengaging she is as a character. This is a disappointment, especially considering so many of the Ghibli movies feature strong female leads. But if you can get beyond that and simply enjoy the movie as a fun and flighty fantasy ride then a much better viewing session is in store for you. While a far cry from other similar titles, The Cat Returns is a worthwhile addition to the Ghibli catalogue and a satisfactory watch that I would feel comfortable recommending to most anyone, anime fan or not. Recommended Audience: Standard Ghibli fare, zestfully clean fun for the whole family.